Diane Lewis lives and works in Manhattan, where she was born. Recipient of the 1976 Rome Prize in Architecture, she has sustained and unfolded the spirit of her education, which provided a firsthand participation in the lively interaction of the architect / theorists and art world of Italy, Germany and New York during the 1970’s at Cooper Union, and at the American Academy in Rome. 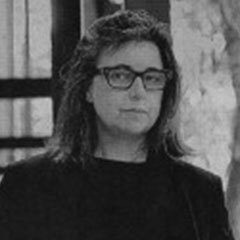 This formative period of innovation and radical resistance cast a tone for her commitment and ability to sustain parallel activities in architectural practice while developing a unique platform on studio teaching, and a commitment to critical writing on architecture. All projects demonstrate the integration of a unique approach to “the architecture of the city.” This urban quality is key to the built work, and the approach to the design studios she has simultaneously conducted. Her knowledge and integration of the impact of the innovations and responsibility of the auteur artist is evident in all these endeavors. A native New Yorker, Lewis is the first Cooper Architect to have been awarded the Rome Prize in Architecture. In 2008 she received the National Design Award from the Smithsonian Cooper Hewitt in recognition of the first 25 years of her independent architectural practice. This award was coincident with the 2007 publication of the monograph of architectural work, entitled “DIANE LEWIS: INSIDE-OUT: Architecture New York City,” Chartabooks Milano/New York. The introduction was written by Richard Meier, with essays by Dean Vidler, Raimund Abraham, Carl Andre and Dan Sherer. Lewis also received the John Q. Hejduk award from The Cooper Union Alumni Association in 2006. Atelier projects include constructed works and commissioned competition entries such as: a 2006 residence for the Dean of the Columbia University Graduate School of Architecture, Perlman Conservatory and campus for Paul Rudolph’s Riverview High School, Sarasota, Gauchos Basketball Foundation, Harlem, Kunsthalle, New York, IIT Student Union Competition 1997, New York Studio School, the HCK Charter School, San Antonio and art galleries such as Kent, Kasmin, Claude Bernard, American Fine Art and SPOT. Work on the Cooper Union campus resulted in placing her office as finalist in two commissioned competitions; one among three finalists for the commission to build the Cooper Union Dormitory in 1989, and runner up for the Hewitt Building Renovation in 1987.